Serial data is still being sent today, one bit at a time, just as it has always been for over 50 years. While serial ports may not be as prevalent on new PCs these days, serial is still in use everywhere. The new PC standard USB has more software overhead and requires more advanced processors to implement, so serial will live on! RS-232 can support data rates of up to 920 kbps (normally 9600 and 115.2K are the maximum rates) and is commonly found in 9 or 25 pin configurations, however only three pins are required. 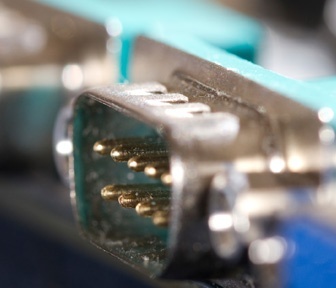 Most applications drop many of the less commonly used pins, though some configurations such as a data modem connect every pin for full handshaking capabilities. An RS-232 is a point to point connection made between a Data Terminal Equipment (DTE) device and a Data Communications Equipment (DCE) device. RS-232 has a maximum cable length of 50 Ft at 9600 baud. This limitation can be overcome by transmitting serial data over another medium. RS-232 ports/cables can be found in factory automation and metering, medical equipment, consumer products, and many other devices. RS-422 offers one of the fastest serial data rates at 10Mbps. RS-422 is a multi-drop configuration, allowing for up to 10 unit loads. Its use of voltage differences makes it ideal for noisy environments. RS-422 can support cable lengths of up to 4000 feet, however its data rate lessens as distance increases. RS-485 provides similar speed advantages as RS-422, allowing for data rates up to 10Mbps. It differs in that it is a multipoint configuration, allowing for support of multiple drivers and multiple receivers. RS-485 can support up to 32 unit loads due to its bi-directional interface. Grid Connect’s Engineering Staff offers deep technical knowledge in all things serial. In addition to offering a wide selection of Serial Products, we can also provide custom solutions to meet your every need. Visit our Website to find that perfect serial product that meets your needs. Coming in future posts in this series on serial we will discuss Serial to Ethernet , Other Serial Transport Methods, RTS/CTS, Null Modems, Gender Changers, Loopback and more!